A fun recreational activity, camping is very popular during summer and spring. However, as the winter comes around, most campers start to pack it due to freezing weather. Don’t let the cold weather stop you from camping and enjoying outdoors. You can extend your camping days to colder months by using a camping heater. Dark and cold nights can be creepy and frustrating, but with a tent heater, you’ll be able to stay warm and get a good night’s sleep. The best tent heater will ensure that you are warm and enjoying your winter camping experience. 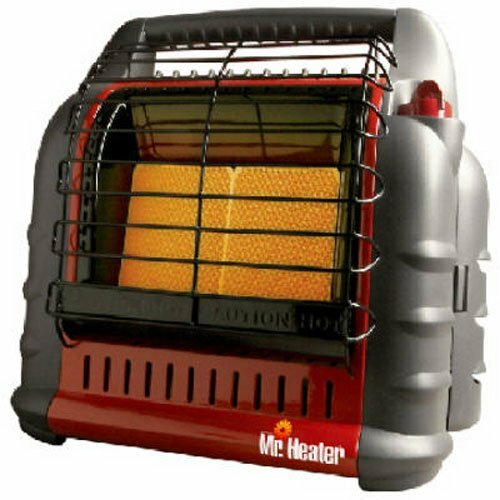 You can easily find heaters for camping at your local sporting goods store or some popular heater selling online sites. How much amount of heat will you require? What type of heater do you need? Can you afford fuel for the heater? Or do you have an extra budget for generator? How much space can your tent afford? How long can the heater run without any interval? 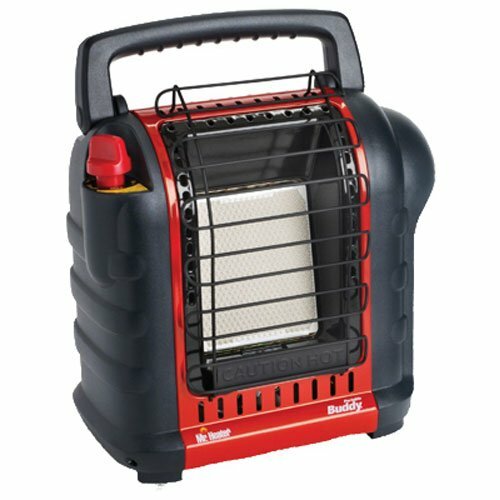 Will the camping area allow you to use certain type of camping heater? How long are your camping trips going to be? Will you camp at campsites where you can reach by your car? Or at wilderness, far away from civilization, where you’ll have to walk certain distance? Now let’s take a quick glance at the brief reviews of the top 5 camping heaters available in the market. Mr. Heater F232000 is the most popular indoor safe propane heater of North America. While putting comfort at its priorities, it exerts 4000 to 9000 BTU in 225 sq ft area. The heat is enough to keep a huge family warm in a large tent. The propane gas used in the heater also keeps the air clean. This unit is quite small and weighs only around 9.5 pounds, making it profoundly portable and easy to carry around. It has a long-lasting porcelain coated heating surface that ensures the heat is spread over wider space. For better durability and easy replacement, its ceramic tile burner is enclosed in a shock absorbing insulation. Also the integrated sensors in the heater will detect the level of oxygen and will automatically shuts off the device. In case the heater is accidentally knocked over, it shuts down immediately, which makes it safe for children. This propane heater is highly recommended for families with kids who love to camp often. There are many campers who love to camp alone. A lone camper in a small tent wouldn’t need a heater that has been designed to warm an entire family or the whole tent. For this a portable personal space heater is an ultimate choice. MyHeat Personal Ceramic Heater is one of the ultimate camping heaters and the best selling electric space heater in the market. You can also save some extra bucks by purchasing this electric heater as it requires only 200 watts to warm up your personal space. Measuring around 3.8 inches by 4.3 inches by 6.1 inches and weighing only 3.5 pounds this unit is extremely portable. The space heater is made of plastic and has a self-regulating ceramic element. It also has some smart features like automatic overheat protection and cool-touch housing. 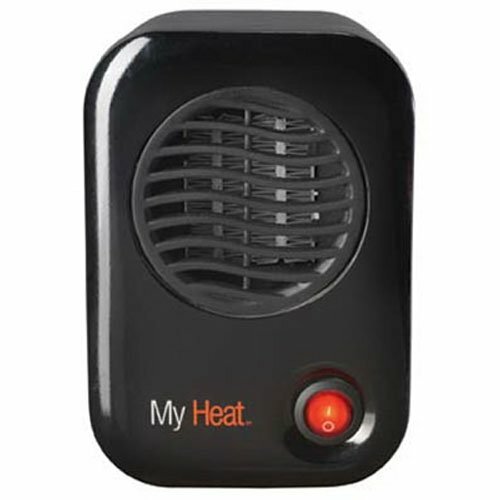 MyHeat Personal Ceramic Heater is also perfect for office or home for personal space heating. 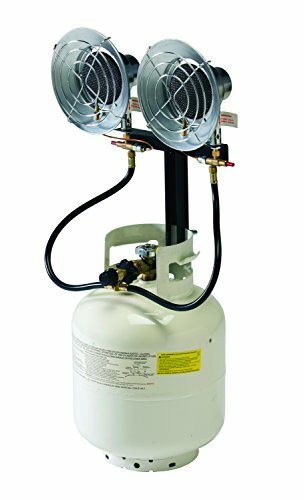 In case you are looking for a portable heater that can heat up much larger area, and ready to pay a higher amount then Mr. Heater Big Buddy Propane Heater is an optimal choice. The heater has 18000 BTU and can heat up to 400 sq ft area. For maximum heat efficiency, the device combines convection heat air flow with radiant heat. The heater features multiple safety features like built-in sensor that detect oxygen levels, with automatic shut down feature. The tip-over switch ensures safety operation always. For additional tile protection and optimum durability, the heater has a heavy-duty safety wire guard. Although this propane indoor heater is a little heavier and a lot more expensive than other options, it also has higher heating efficiency. Mr. Heater F215100 Little Buddy is the ultimate choice if you need a small yet very powerful heater. The heater can exert 3800 BTU in 95 sq ft room. It should be able to provide enough warmth for smaller tent or RV. 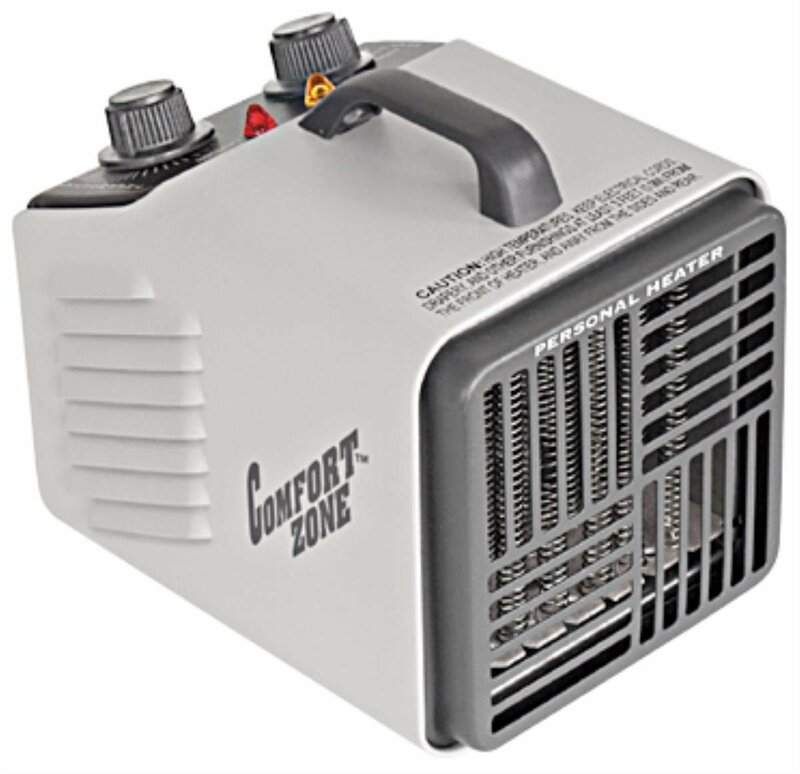 The heater is much smaller in size than other propane heaters and hence it’s more convenient to carry around. It can also fit in some camping backpacks, hence making it great for trekking or hiking. Like other camping heaters from Mr. Heater, this unit also has a built-in sensor that shuts down the device automatically when the oxygen level is low. It also has an immediate shut-off feature in case it’s accidentally tripped over. 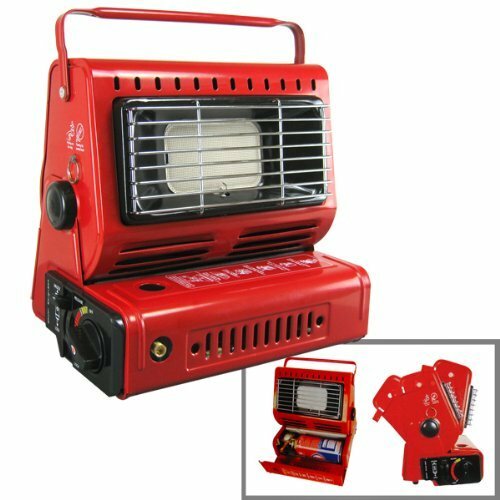 This heater is more affordable, and due to its small size it’s highly recommended for outdoor enthusiasts. 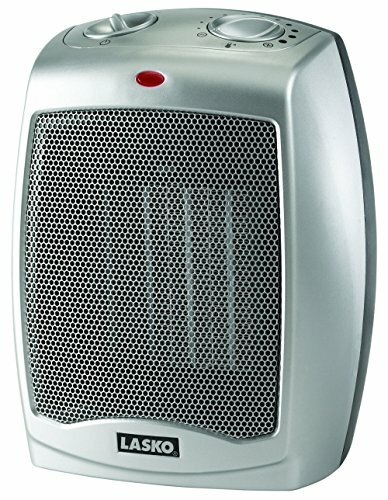 While you need to have access to power supply and power cable to run an electrical camping heater, this 754200 Ceramic Heater by Lasko comes in handy with different heat settings, if you have access to those. The unique heat setting feature can be very useful to those who need the heater for camping in areas with varied temperatures. For higher temperature the device can be set to minimum 900 watts and for colder temperature and larger tent, it allows the user to set to 1500 watts. This versatile heater also has a cooling-fan feature that can be used during hot summers to cool down your tent or camper van. This Lasko heater is small in size, making it one of the most portable units. It also has some smart features like automatic over-heat protection. Unlike other fan heaters, this device operates quietly without making any sort of noise. Many of you may not have too much time for thoroughly researching each product individually, so given below is a comparison table of the 10 best selling camping heaters based on some of their aspects. Tent heaters can operate on either fuel or electricity. Heaters that use propane are more expensive than electric heaters, but are more powerful and safer for the user and environment as they don’t dry out the air much unlike electrical heaters. 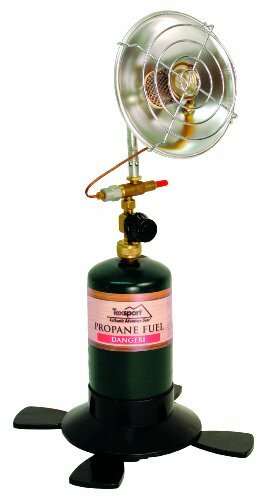 Other camping gear like tent stove can also be powered by the propane used in the tent heater. 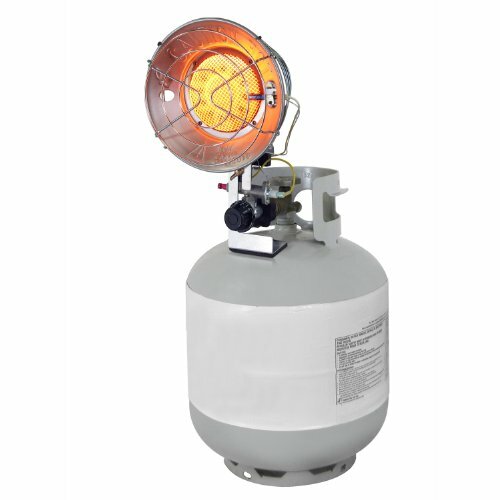 Although propane can be a bit risky for enclosed space, but there are many indoor safe propane heaters. The best indoor propane heaters are the most expensive ones, but will function a lot better than any other type. Butane is commonly used in liters. 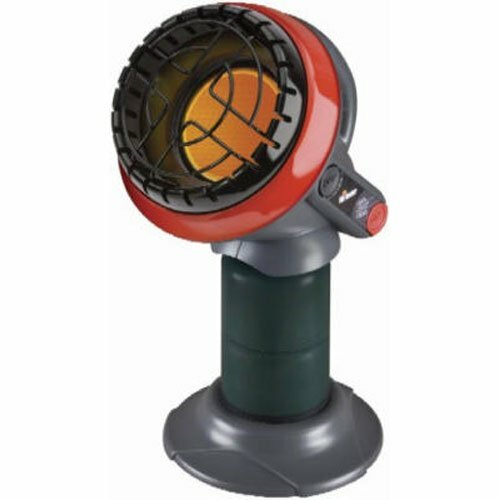 There are some outdoor heater models that use butane to operate. However, butane tent heaters are not so safe for use in enclosed space like tent. A catalyst heater functions by combining oxygen and propane with a platinum catalyst. This type of device is flameless, but the front grill of the unit can still heat up. If you have an access to power outlet or a generator at the campsite, then electric campaign heater can be a good alternative. Electrical units are cheaper, so these are also most commonly used. Again, there are different types of electric heaters, such as fan electric heaters, electric radiators and electric halogen heaters. Each type has their own sets of benefits and limitations. For closed space, electrical heaters prove to be best and safer as they are flameless. Before purchasing a particular type, make sure that the area of your camping allows that. It’s no use buying an electric heater if you don’t have access to electricity or generator. Size is another aspect that can’t be overlooked when it comes to camping. You would want a gadget that can be easily carried around. Size plays a major role during transportation, and with smaller size, your storage space will also be maximized. Also, if your tent has a limited space, you can go for the model which will occupy lesser space. If you are often going to camp somewhere at the wilderness, where you can’t reach with your car and you might have to walk a few distance, you must also consider the weight of the heater. As you are going for camping, you’ll have to carry along a lot of things, so the weight has to be limited. It will be good if you pick a unit which is light and portable. However, in case you are getting a heater for RV, weight is hardly a matter of concern. Thermal output or BTU is the amount of heat given out by the heater to warm up a particular space. While this can be very confusing for some buyers, but before going for the purchase it’s very important to calculate the amount of heat you will need. You must buy a heater with enough BTU rating. BTU can be easily calculated by considering the size of your tent and the liable temperature of your camping area. The camping heaters will be able to warm up your tent or RV quickly in no time. Fuel and electricity are going to add an extra expense to your winter camping experience. The number of cylinders required and the unit of electricity needed must be calculated. The best heaters for camping will consume less fuel or power but function more efficiently. When it comes to camping heaters, it’s very important that you choose the right unit. Many models may have similar functions up to some extent, but a small variation makes a big difference. So consider all the necessary factors and choose the heater that best suits your requirements. Look good reviews that can help for buyers to choose the best ones. Hey there, yes these reviews are definitely awesome and a quick way to scan through to get some specs on the heaters. Nice post, thanks for sharing. The best camping heaters should be the safest heaters. Portability is also paramount. Thankfully, the market has something for everyone, under all budgets. I bought a megamaster camp heater to warm up the bathroom. I did not realise that the gas tin which is 200g gets used up in about 1.5h. Either I am using it incorrectly but I am now on my third tin. I do not leave the heater burning for 1.5 hours but it is approx. This makes it very very expensive. So if anyone can explain where I am going wrong please do.